U.S. Climate negotiator Todd Stern has filed a Declaration with the D.C. Circuit Court of Appeals on behalf of EPA in State of West Virginia et al. v. U.S. Environmental Protection Agency. Twenty-seven States and three major industry groups have petitioned the Court to stay (suspend) the Clean Power Plan (CPP) while the rule is litigated on the merits. I discussed the coal industry’s petition here. Petitioners argue the CPP will do irreversible harm to coal producers and coal state economies even if the Court later overturns the rule as unlawful. To implement the CPP, State legislatures and public utility commissions will have to start revising their electricity laws and regulations immediately, and the CPP has already begun to drive capital out of the coal industry. In contrast, delaying the CPP will not harm public health or welfare since the rule’s potential climatological impacts even in 2100 will be too small to detect, and States that want to cut carbon dioxide (CO2) emissions from their power sectors will still be free to do so. UNFCCC [UN Framework Convention on Climate Change] Parties have previously noted the need for urgent action to hold the increase in the global average temperature below 2 degrees Celsius above pre-industrial levels, in order to lessen the impacts of climate change. . . .Based on my experience as the lead U.S. climate negotiator, I believe that the ambition and implementation of many other countries’ current and future emission control actions depends significantly on the understanding by their leaders of the seriousness of the U.S. commitment to address emissions. For many countries, willingness to take action depends on collective trust that the major emitters are taking action. If a stay of the Clean Power Plan is granted, there is a real threat that some other countries, including major emitters, might reduce the intensity or pace of their actions or even fail to achieve their commitments. Melodramatic twaddle. As Manhattan Institute scholar Oren Cass explains in recent testimony, under COP21, nations’ INDCs are unverifiable and unenforceable, and the major developing countries — China, India, and Brazil — have essentially promised to achieve emission reductions that are projected to occur anyway. All INDCs combined would theoretically avert only 0.1ºC-0.2ºC of warming by 2100. Besides, what the overwhelming majority of delegates at COP21 care about is not the Clean Power Plan but getting commitments from the United States and other industrialized nations to fork over $100 billion to $450 billion annually in foreign aid (renamed “climate finance”). But it’s the legal theory implicit in Stern’s Declaration that the judges should find most interesting. Stern says the Court should not stay the Clean Power Plan because doing so could weaken other governments’ commitment to climate action. But judges grant stays only if they believe petitioners are likely to prevail on the merits. In effect, Stern asks the Court not to stay the rule even if the judges have serious reservations about the rule’s legality. How far is he willing to push that thesis? If the CPP is too important to U.S. climate policy for the Court to stay the rule, regardless of its legal defects, then, logically, the CPP is also too important for the Court to overturn on the merits, regardless of its legal defects. And there you have the legal theory behind the CPP in a nutshell. If a policy advances “climate action,” then it must be deemed legal regardless of how defective the statutory justifications for it might be. Or, more to the point, what matters is not the Clean Air Act that Congress wrote but how EPA would “rewrite it to suit its own sense of how the statute should operate” (UARG v. EPA, slip op., p. 26). So although Stern’s factual claims are overblown and his implicit legal theory is junk, his climate diplomacy might be more influential with U.S. judges than with foreign leaders. I would encourage petitioners to point out that, in Massachusetts v. EPA, the Supreme Court held that EPA’s authority with respect to greenhouse gases could not be decided on the basis of “policy concerns” “divorced from the statutory text” (slip op., pp. 18, 30). The Court specifically cited as irrelevant the concern that domestic climate policy “might impair the President’s ability to negotiate with key developing nations to reduce emissions” (p. 31). 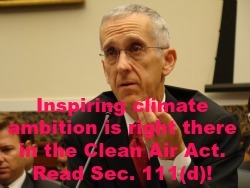 There is no mention of U.S. “climate leadership” or other nations’ “climate ambitions” in §111(d) of the Clean Air Act or, for that matter, anywhere else in the statute. There was a time too when courts would examine the words of a statute to discern the intent of lawmakers in enacting a provision. If I recall correctly, section 111(d) of the Clean Air Act states specifically that the justification for declaring a substance a pollutant and regulating a new substance must be to improve “health and welfare”. What the Administration would have to show is that regulating CO2 would improve health and welfare. But of whom? Did Congress intend the EPA to improve the health and welfare of people worldwide? Or only of Americans and any foreign parties covered by international treaties? And even if regulating CO2 would improve the health of some Americans, does it follow that net welfare would be improved? In my opinion the Clean Air Act required the EPA to show that improving the health of some Americans will also produce a net benefit to Americans in general or at least regionally. It is incredible that any court would read into the Clean Air Act that Congress intended to improve the health and welfare of people worldwide at the expense of American taxpayers and consumers. That is a fantasy of the present incumbent of the White House.